Is Oklahoma State still a factor in the Big 12? If you could have one image to define the college football season thus far, it would probably come from the Big 12, specifically Oklahoma’s Baker Mayfield, capping off the most earth-shattering win of the season over Ohio State by planting the OU flag in the Block O on Ohio Stadium’s field. Imagery aside, though, the conference has only one team in the top 10 (TCU) and three in the AP Top 20. It’s difficult at the midpoint to see a scenario where this conference doesn’t eat its own in the end from a playoff perspective, but the top 3 are in a class above the rest, and the bottom two (Kansas and Baylor) are in a class maybe of their own in all of Power 5 football. The middle is sort of a hodge-podge of something betwixt decent and totally average, meaning that all games involving TCU, Oklahoma, and Oklahoma State will take center stage from here on out. You can pretty much stick your flag in the ground on that. Kansas has been bad. That literally is about the only thing that’s gone as planned in the Big 12. You could argue also that Oklahoma State, with all of its offensive bluster and bombast predictably found a way to slip up inexplicably in an early-season game, and I wouldn’t argue you there, either. TCU is the lone unbeaten team in the conference, buoyed by the Kenny Hill we remembered bursting on the scene in College Station and a typically salty defense, has been much better than expected and advertised. They went into Stillwater and looted the house, planting their flag (there’s that image again) in the center of the Big 12’s field as the most likely representative for the conference in the CFB Playoff. Not that anyone expected Baylor to be banging down the door of the conference title, especially with the upheaval surrounding the program plus breaking in a new regime, but few expected them to be in the running for “worst Power 5 conference team.” They’ve found spectacularly inconsistent ways to lose games, whether it’s letting Liberty (?!?) hang nearly 50 on them, then the next week losing 17-10 to UTSA. They did challenge Oklahoma, but it looks like their tilt with Kansas will be for the Terrible Trophy, annually given to the most wretched team in each conference, one that the Jayhawks have had a monopoly on. Iowa State linebacker Marcus Spears spoke in the offseason about having only one meaningful snap last season, as he was mostly a special teams and an “empty the bench” time guy. Alas, those days are gone. The redshirt sophomore has exploded onto the scene. He’s third in the conference in tackles and has shown a knack for the big play, leading the Big 12 in forced fumbles. Not bad for a guy only getting his cuts on special teams mostly at this time last year. In spite of OU’s upset loss to Iowa State, Baker Mayfield has perhaps been the most talked about player in college football this season. But he has the talent to back up his moxie. To date, possibly the biggest win in college football has been Oklahoma defeating Ohio State, led by a fired-up Mayfield who literally planted his flag in the Block O at the Horseshoe. He’s tops in the conference in pass efficiency and his 15 touchdown passes rank second best in the conference. OU’s offense has carried the day. Can Baker play linebacker? 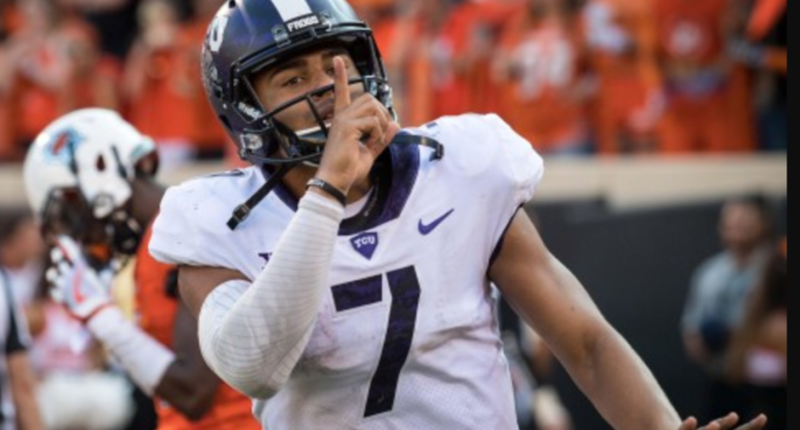 ** Who will emerge as the most likely CFB Playoff contender among the only three with a realistic shot, TCU, Oklahoma, and Oklahoma State? ** Can the Oklahoma defense regroup after giving up 72 points the last two weeks to Big 12 teams that came in with losing records? This list is pretty fluid, beginning with this upcoming weekend where both TCU and Oklahoma could post Ls and effectively change the balance of the importance of other games, but with the Horned Frogs as the only unbeaten currently in the league, every game they play gets more important per every week they win. The Big 12 schedule is oddly set up so the main contenders play games that likely won’t be huge challenges, and you kind of wonder if this is by design before realizing how preposterous that sounds to have that much foresight into the future. I know people don’t want to hear this, but only TCU and Oklahoma have a shot at the College Football Playoff, and based on what’s going on in the other conferences, plus the fact that one of them is guaranteed a first or another loss late in the season by playing each other, the Big 12 gets locked out of the playoff.